Join us for a large-scale pop-up art exhibition, cultural convening, and community organizing event. Together, we will lift our voices, assert our power and identify solutions to build healthy and safe communities worldwide. Monroe Gallery of Photography is honored to present a very special collection of Civil Rights photographs at the Manifest Justice exhibit in Los Angles May 1 - 10. As a symbol for globetrotting photojournalism, Margaret Bourke-White’s brand in the field is still felt today. Born on June 14, 1904, in New York City, she soon would become a beacon for editorial photography, focusing on subjects both live and inanimate, and securing the first cover image for LIFE magazine—an iconic study of the dams in the Columbia River basin. Monroe continues, “America was largely illiterate in 1936, and this woman met [LIFE editor] Henry Luce and was the first person hired for his magazine, which is also extraordinary—because she’s a girl,” she says, with a playfully scandalized tone. The Don Gaspar gallery showcases 54 of Bourke-White’s emblematic images, starting this Friday and going through June 28. Before her death of Parkinson’s disease in 1971, Bourke-White managed to stamp her unique perspective on historic events like Gandhi’s release from prison in 1946, the ripple of the South African labor exploitation during the 1950s and the liberation of German concentration camps by General Patton. The breadth of Bourke-White’s oeuvre as well as her approach, Monroe stresses, far surpasses whatever labels one might want to stick on her based on gender. 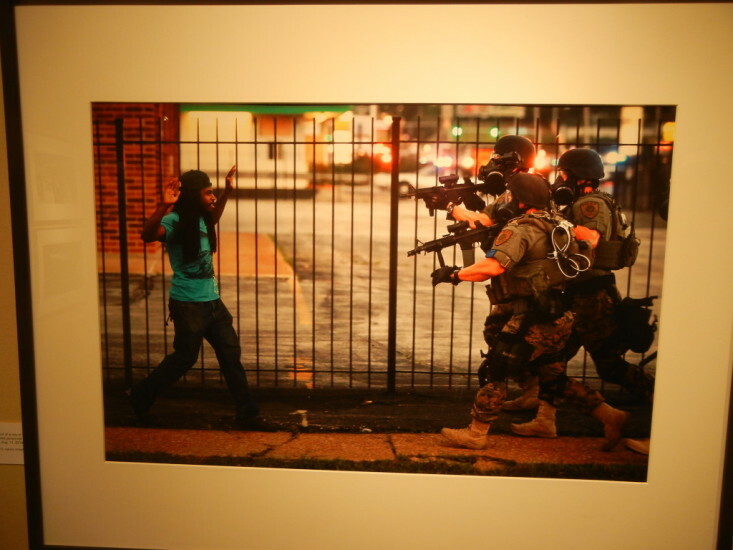 "Monroe Gallery of Photography (here): Classics of photojournalism often quickly jump into the realm of fine art, and this recent image by Whitney Curtis from the Ferguson protests is memorably symbolic. It’s a modern version of Goya, with the compositional opposition of the hands up and the over-the-top riot gear. Priced at $2500"
"38 years ago today I won my second Pulitzer. I recently found this clip (I have lots of clips but where they are nobody knows, including me). With the help of my friend Scott Ryder we copied a lot of stuff lately. It was Marathon Day, April 18, 1977. The Marathon back then began at noon. I raced (by car) back to the finish line at the Prudential Building after covering the start in Hopkinton. The winners would start showing up around 2:10. Monroe Gallery of Photography specializes in classic black-and-white photography with an emphasis on humanist and photojournalist imagery. The gallery features work by more than 75 renowned photographers and also represents a select group of contemporary photographers. The gallery (booth #119) is exhibiting a specially curated collection of civil rights photographs at the AIPAD Photography Show 2015. Featured will be a variety of images from the history of civil rights, with prints including the 1965 Selma March to the recent protests in Ferguson, Missouri. Monroe Gallery's booth is also exhibiting the environmental documentary photography of Stephen Wilkes, specifically images from Hurricanes Katrina and Sandy; and one from the Deepwater Horizon oil spill. Of particular note is a large format (50 x 66") color print of a television set washed up on the beach of Bay St. Louis, Mississippi after Hurricane Katrina that is visually arresting. Monroe Gallery of Photography was founded by Sidney S. Monroe and Michelle A. Monroe. Building on more than four decades of collective experience, the gallery specializes in 20th and 21st Century Photojournalism. April 5, 1976: "The Soiling of Old Glory"
In 1976, during an outdoor demonstration against court-ordered school busing in Boston, a white teenager swung a pole holding an American flag at a black attorney in a scene captured in a Pulitzer Prize-winning photograph by Stanley Forman of the Boston Herald American. Monroe Gallery of Photography will be exhibiting this photograph at the AIPAD Photography Show in New York April 16 - 19, 2015, in booth #119. The photograph depicts a white teenager, Joseph Rakes, about to assault black lawyer and civil-rights activist Ted Landsmark with a flagpole bearing the American flag. It was taken in Boston on April 5, 1976, during a protest against court-ordered desegregation busing. It ran on the front page of the Herald American the next day, and also appeared in several newspapers across the country. It won the 1977 Pulitzer Prize for Spot Photography. compelling and so difficult to resolve." The National Press Photographers Association's Best Of Photojournalism 2015 awards were announced on Tuesday, March 31. Rashaad Davis, 23, backs away slowly as St. Louis County police officers approach him with guns drawn and eventually arrest him on Monday, Aug. 11, 2014, at the corner of Canfield Drive and West Flroissant Avenue in Ferguson, Mo. Members of the community took to the streets to protest the fatal police shooting of Michael Brown by police officer Darren Wilson. In Domestic News, first place was awarded to Whitney Curtis of The New York Times. Whitney Curtis is now represented by Monroe Gallery of Photography, and several of her momentous images from Ferguson, Missouri will be exhibited during the AIPAD Photography Show April 16 - 19 (Booth #119, Monroe Gallery of Photography). The Gallery will be exhibiting a specially curated collection of Civil Rights photographs from the 1965 Selma march to the present day. Curtis' photographs will also be featured in the exhibition "Civil Rights from Sema to Ferguson" at Monroe Gallery of Photography July 3 - September 20, 2015. Photos that raise awareness, reveal truth, and ask us to pause. Reflect. Photojournalism is how Whitney Curtis tells stories we might have never known otherwise. As an editorial, corporate, and commercial photographer, Whitney’s goal is simple: show respect to the subject-matter by creating intimate, creative images that illustrate the story. After graduating with a degree in photojournalism from the University of Missouri-Columbia, Whitney worked as a staff photojournalist at The Kansas City Star, northern Utah’s Standard-Examiner, and the Daily Herald in suburban Chicago. As an editorial photojournalist, Whitney’s work has been honored by The Associated Press, NPPA’s Best of Photojournalism, CPoY, and Women in Photojournalism.